And you thought we just moved boats. Ha. 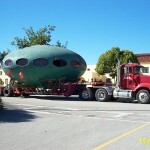 Over the years, our unique skills and equipment have been put to the test moving houses, planes, missiles, submarines, towers, sculptures – just about anything that needed to go somewhere. The fact that our equipment is designed to be disassembled and reassembled under the wide load, with custom cradles built on site for heavy transport, we’re perfectly suited to haul just about anything. 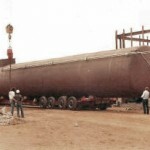 We like to say of our regular long-haul trucking friends: “We can take their load, but they can’t take ours.” Below are just a few of the more interesting wide loads and heavy transport projects in years past, with photos. Built in the early 70’s from a plan by Finnish designer Matti Suuronen, these approximately 600 square foot saucer shaped homes were designed to revolutionize the housing industry. Less than 100 of these homes were built, about evenly divided between Finland and the rest of the world. After a life–long fascination with these modules, the current owner found this one in a canyon in San Diego, bought it and restored it in our boat yard. We moved it to an Idyllwild, CA mountaintop to become his vacation home. 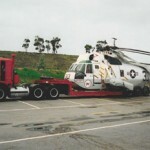 In the early 2000’s the navy needed to move this F-18 from a display pedastal near the Point Loma lighthouse in San Diego, down to a new place on the base. 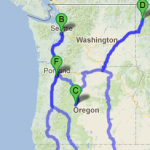 So with all their various vehicles and technical capability…. they called San Diego Boat Movers, of course! 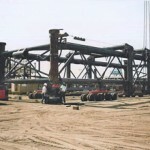 This gargantuan apparatus was built at Knight and Carver in National City, CA to serve as an anchor for the ends of the sewer outflow pipes off Point Loma. 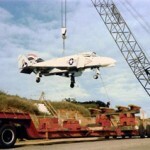 It was built in an open yard (pictured), and then had to move a short distance to be loaded onto a barge for deployment. Lots of man hours, lots of individual dollies – and it all went smooth. This monster came into San Diego on a train, bound for a milk processing plant in Escondido. Over 80 feet long, and nearly 16 feet in diameter, it wasn’t exactly something you could stuff into a UPS truck. Thankfully we didn’t shorten the trailer pictured in use here until AFTER this haul! Navy helicopters run a lot of training missions around Otay Lakes, CA. These include water rescue simulations, water skimming, etc. On rare occasions, a helicopter will take a dunking. Oops. Regulations say they can’t fly it over civilian areas until after a thorough go-over, so they call San Diego Boat Movers to get the dripping bird back to base. We get a lot of funny looks from drivers on the way there. 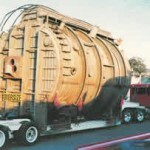 When General Dynamics closed down, they had two of these giant 40 ton, 18ft diameter vacuum chambers on site. We removed all connections, broke them down as small as possible, and delivered them to the SDBM yard for storage. Eventually the new owners had us haul them up to LA and Lancaster. 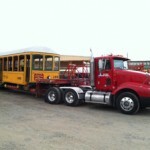 One of just a handful of classic turn of the century San Diego Trolley cars, one of our clients keeps this in our yard, and has had it restored to its former glory. Periodically we (gratis) haul it around town to various historical events, and sometimes tow it as part of a parade (SDBM truck all shiny in front, of course! ).